Annie’s Puzzles Online is a section of Annie’s Resource Attic with puzzles made using photos or artwork from various activity sets. You access these puzzles by going to them from your browser, just as you would go to any other web page, and then work the puzzle online. The puzzles are hosted on Jigsaw Planet, a site that lets you upload images, choose a layout, and instantly turn the image into a puzzle. One option is to embed these puzzles into a web page. That’s how they come to Annie’s Resource Attic. The following tips will help you get the most out of the online puzzles. Scroll down below these suggestions or click here for an index with links to all the puzzles. Each online puzzle also has a link at the foot of the main page for that activity set. Toggles a dim, ghostly puzzle picture hint. Lines up or scatters pieces to the edges leaving the center clear. Many options! Change background color, Restart, Help, Settings including: have ghost showing as the puzzle opens, have image showing as the puzzle opens, outline puzzle when ghost is hidden, open puzzle in full-screen view. Play puzzle on Jigsaw Planet website. Disadvantages: No easy route back to Annie’s Puzzles Online. Ads and random puzzles offered. Advantage: the option to change number of pieces. 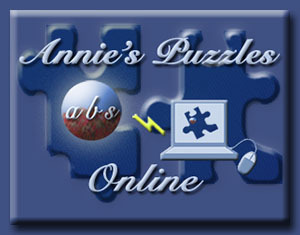 Toggles full-screen view and returns to Annie’s Puzzles Online on the page where you started. Restart the puzzle, scattering pieces and setting time to 0. This control only appears once you finish a puzzle. Click or touch pieces to select them. Drag the pieces around. When pieces match correctly, you’ll hear a click as they join. Scroll down below the puzzle for links to this page, the activity set main page, and the Annie’s Resource Attic home page. I chose portrait orientation for ease in use on tablets and phones. That means you must scroll down to see puzzle controls and links buttons on monitors and laptops. Use full-screen view while working the puzzle, especially on monitors and laptops. Toggle back to regular view, then scroll down to access buttons when you are done. Expect to wait a few minutes for loading. The puzzle page has to go to the host site, grab the puzzle, and load the puzzle. If you need more space, consider temporarily closing the Bookmarks and Navigation toolbars. If you have a very old system, you may still need an updated version of the Java plug-in installed and active. The Java plug-in has been inactivated for browsers in Mac OSX 10.5 or earlier, as of May 2012, to prevent users from possibly getting malware. Application needed: Any web browser on a computer or mobile device. Abby Crowned Lemur Puzzle link: abby/index.html Online puzzle, 12 pieces. Image is Abby, a female crowned lemur from the Madagascar Lemurs activity set. Animals Puzzle link: allAnimals/index.html. Online puzzle, 20 pieces. Image is a collage of 20 animals, from a small earthworm to a big bear, from the What I Like Best About Animals book. Bridge In The Jungle Puzzle link: bridge/index.html Online puzzle, 12 pieces. Image is the bridge over the jungle stream from Treasure Hunt!. Cat and Dog Puzzle link: catDog/index.html Online puzzle, 12 Pieces. Image is the cat and dog from Visiting A Petting Farm. Cavorting Sea Lion Puzzle link: cavortingSeaLion/index.html. Online puzzle, 20 pieces. Image is a sea lion soaring underwater, from Sea Lion Facts. Compass Tree Euphorbia Puzzle link: compassTree/index.html Online puzzle, 20 Pieces. Image is a close up view of a compass tree, a type of euphorbia that is supposed to always lean to the south, from Madagascar Adventures. Coquerel’s Sifaka Puzzle link: Coquerel’sSifaka/index.html Online puzzle, 20 pieces. Image is a close up view of a Coquerel’s Sifaka Lemur, from Madagascar Adventures. Crested Terns Puzzle link: crestedTerns/index.html Online puzzle, 20 pieces. Image is a large flock of crested terns, from Madagascar Adventures. Curlew Puzzle link: curlew/index.html Online puzzle, 12 pieces. Image is the curlew from Shore Birds. Dwarf Chameleon Puzzle link: dwarfChameleon/index.html Online puzzle, 24 pieces. Image is a tiny bright green chameleon, no bigger than a man’s finger, from the Madagascar Adventures activity set. Eastern Grey Bamboo Lemur Puzzle link: greyBamboo/index.html Online puzzle, 20 pieces. Image is a close up view of an Eastern Grey Bamboo Lemur, from Madagascar Adventures. Galapagos Sea Lions Puzzle link: GalapagosSeaLions/index.html. Online puzzle, 20 pieces. Image is a group of sea lions posing on the beach, from Sea Lion Facts. Gavin Crowned Lemur Puzzle link: gavin/index.html Online puzzle, 12 pieces. Image is Gavin, a male crowned lemur from the Madagascar Lemurs activity set. Giant Millipede Puzzle link: millipede/index.html Online puzzle, 20 pieces. Image is a giant millipede, from Madagascar Adventures. Gingerbread House Puzzle link: gingerbreadHouse/index.html Online puzzle, 12 Pieces. Image is one of the decorated gingerbread houses from the Gingerbread House activity. Goat Puzzle link: goat/index.html Online puzzle, 12 Pieces. Image is the nanny goat and kid from Visiting A Petting Farm. Holiday Tree Puzzle link: decoratedTree/index.html Online puzzle, 12 Pieces. Image is one of the decorated trees from the Holiday Tree activity. Hubbard’s Sportif Lemur Puzzle link: sportifLemur/index.html Online puzzle, 24 pieces. Image is a very rare Hubbard’s Sportif Lemur in a tree at sunset, from Madagascar Adventures. Isalo National Park Puzzle link: isalo/index.html Online puzzle, 24 pieces. Image is a sedimentary cliff face with tapia trees on flat surfaces, a scene in Isalo N. P., from the Madagascar Adventures activity set. Island Surprises Puzzle link: islandSurprises/index.html Online puzzle, 12 pieces. Image is pirogues at sunset from the Madagascar Lemurs activity set. Jaguar Puzzle link: jaguar/index.html Online puzzle, 12 pieces. Image is the jaguar from Mayan Jungle Adventure. Jason And His String Puzzle link: JasonString/index.html Online puzzle, 12 pieces. Image is Jason Cat holding his string from Jason’s String. Jason Finds His String Puzzle link: JasonFinds/index.html Online puzzle, 12 pieces. Image is Jason Cat in a tree from Jason’s String. Jellyfish Puzzle link: jellyfish/index.html. Online puzzle, 12 pieces. Image is an orange jellyfish drifting in deep blue water from the What I Like Best About Animals book. Kiki Lemur Puzzle link: kiki/index.html Online puzzle, 12 pieces. Image is Kiki, a Eulemur from the Madagascar Lemurs activity set. Koto Bamboo Lemur Puzzle link: koto/index.html Online puzzle, 12 pieces. Image is Koto, a Gentle Gray Bamboo lemur from the Madagascar Lemurs activity set. Little Toot Puzzle link: toot/index.html Online puzzle, 12 pieces. Image is the boat, Little Toot. Madagascar Silk Spider Puzzle link: goldenOrbSpider/index.html Online puzzle, 20 pieces. Image is a huge Madagascar Golden Orb spider, from which the native people can make silk fabric, from the Madagascar Adventures activity set. Mama and Baby Sifakas Feeding link: maBabySifakas/index.html Online puzzle, 12 pieces. Image is mama and baby Coquerel’s sifakas feeding in the forest, from Madagascar Adventures. Mama and Baby Sifakas Up Close Puzzle link: maBabyClose/index.html Online puzzle, 24 pieces. Image is mama and baby Coquerel’s sifakas sifakas close up view, from Madagascar Adventures. Olmec Head Puzzle link: olmec/index.html Online puzzle, 12 pieces. Image is the big Olmec stone head from Mayan Jungle Adventure. Pachypodium Puzzle link: pachypodium/index.html Online puzzle, 20 pieces. Image is a strange looking, thick-trunked pachypodium plant from the Madagascar Adventures activity set. Pirate Lemur Puzzle link: rufusPirate/index.html Online puzzle, 12 pieces. Image is Rufus, a Eulemur from the Madagascar Lemurs activity set, dressed as a pirate. Platypus Puzzle link: platypus/index.html. Online puzzle, 12 pieces. Image is a platypus with its nest and two eggs from the What I Like Best About Animals book. Radiate Tortoise Puzzle link: radiateTortoise/index.html Online puzzle, 24 pieces. Image is a rare radiate tortoise from Madagascar Adventures. Red Sea Urchin Puzzle link: seaUrchin/index.html Online puzzle, 20 pieces. Image is red sea urchins underwater with sea grass from the Madagascar Adventures activity set. Red-Tailed Tropicbird Chick Puzzle link: tropicbirdChick/index.html Online puzzle, 24 pieces. Image is a red-tailed tropicbird chick in a nest on the ground from the Madagascar Adventures activity set. Ring-Tailed Lemur Puzzle link: ringTail/index.html Online puzzle, 12 pieces. Image is a Ring-Tailed Lemur from the Madagascar Lemurs activity set. Ring-Tailed Lemur Lookout Puzzle link: ringtailLookout/index.html Online puzzle, 24 pieces. Image is a Ring-tailed Lemur watching for strangers from the Madagascar Adventures activity set. Rufus Lemur Puzzle link: rufus/index.html Online puzzle, 20 pieces. Image is Rufus, a Eulemur from the Madagascar Lemurs activity set, standing on a sign pointing toward Madagascar. Rufus Lemur Flying Puzzle link: rufusFlying/index.html Online puzzle, 12 pieces. Image is Rufus, a Eulemur from the Madagascar Lemurs activity set, flying over the coast of Madagascar in his snazzy orange airplane. Ruins Puzzle link: ruins/index.html Online puzzle, 12 pieces. Image is stone room in the ruins from Mayan Jungle Adventure. Scorpion Puzzle link: scorpion/index.html Online puzzle, 24 pieces. Image is a large poisonous scorpion, from Madagascar Adventures. Sea Lions Gardner Bay, Española, Galapagos Islands Puzzle link: likeMom/index.html. Online puzzle, 20 pieces. Image is Sofie Sea Lion looking at hundreds of sea lions that look like her mom, from Sofie’s Adventure. Seashells Puzzle link: seashells/index.html Online puzzle, 12 pieces. Image is seashells including the starfish from Treasure Hunt!. Sea Star Puzzle link: seastar/index.html Online puzzle, 12 pieces. Image is a sea star from No Bones About It!. Sheep Puzzle link: sheep/index.html Online puzzle, 12 pieces. Image is a sheep from Visiting A Petting Farm. Sifaka Lemur Mom And Baby Puzzle 12 Pieces link: sifakaMom/index.html Online puzzle, 12 pieces. Image is a female Coquerel’s sifaka lemur holding her baby, from the Madagascar Lemurs activity set. Sofie And The Big Sea Lions Puzzle link: bigBoys/index.html. Online puzzle, 20 pieces. Image is Sofie looking at the big sea lions playing in the surf, from Sofie’s Adventure. Spiny-Tailed Iguana Puzzle link: iguana/index.html Online puzzle, 24 pieces. Image is a spiny-tailed iguana that blends into the sandy soil so it is almost invisible, from Madagascar Adventures. The Tide Turns Puzzle link: tideturns/index.html Online puzzle, 12 pieces. Image is a scene of the beach with tide coming in from Tide Pools. Tomato Frog Puzzle link: tomatoFrog/index.html Online puzzle, 24 pieces. Image is a bright red tomato frog, from Madagascar Adventures. Verreaux’s Sifaka Puzzle link: verreaux’sSifaka/index.html Online puzzle, 24 pieces. Image is a Verreaux’s Sifaka in a tree, from Madagascar Adventures. Verreaux’s Sifaka Closer Puzzle link: verreaux’sSifakaCloser/index.html Online puzzle, 24 pieces. Image is a Verreaux’s Sifaka looking down at you, from Madagascar Adventures.